The Commission's stated purpose is to improve heath care through accreditation. EncaptureMD creates IAC-compliant clinical reports with our echocardiography, nuclear stress testing and vascular ultrasound applications. We work with Accreditation specialists to ensure that our customers can obtain and then maintain accreditation. 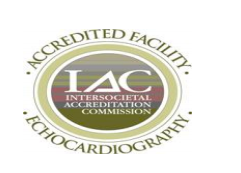 Soon, we will support new IAC standards for Electrophysiology as accreditation is adopted by our customers. IAC accreditation requires work to gather and submit information for the Commission's representatives to assess. EncaptureMD's statistical analysis and teaching tools provide an easy way to record and publish report turn around time by report type, location and physician. This tool can be used to ensure that physicians are completing their reports in a timely fashion and can then generate the spreadsheet needed to submit this data to IAC. Image quality and completeness is assessed as part of accreditation. Sites submit representative samples of their work. EncaptureMD provides an easy way to index those samples. Samples can be indexed throughout the year using our Teaching Tools component OR for collection at year's end. Keep folders for each year and each submission type. If your site is accredited, we can place the IAC accreditation symbol on your report headers. Whether one or all of your labs is accredited, you can display the symbol proudly.